Tax exemptions reduce the amount of tax revenue that governments get from income, sales or property taxes. They are hidden from view. (3) the government must make up the difference by incurring a deficit and borrowing to cover it. Don't blame Obama for this. They have been flat during his administration. Tax expenditures started rising at the end of the Clinton administration and soared after 2000 at the beginning and end of the George W. Bush administration. That's the long story short. 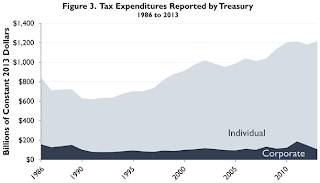 For details, go to A Brief History of Tax Expenditures published by the Tax Foundation, which is an organization that grieves for public tax burdens and seek to inform the public about why they should take it personally. There is a podcast available here. To subscribe via RSS, click here.